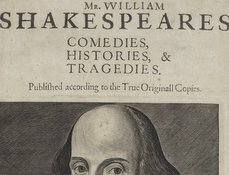 The registered copy of Shakespeare’s last will and testament is shown here. The original will was probated on June 22, 1616, and entered in the register shortly thereafter. 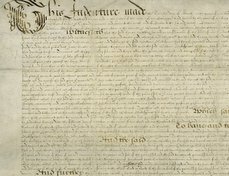 After Shakespeare's death in April 1616, one or both of his executors—Susanna and John Hall-- delivered his will to the Prerogative Court of Canterbury, in London, for probate, and to be copied into a parchment register. The will was probated in the Prerogative Court of Canterbury rather than in Warwickshire because Shakespeare owned property in more than one county: the Blackfriars gatehouse in London, in addition to his various properties in Warwickshire. 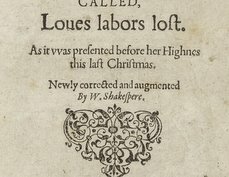 The probate clause in Latin at the end of the third leaf of the original will indicates that John Hall, Shakespeare's son-in-law and co-executor, made an oath to administer the estate on behalf of himself and his wife Susanna, on June 22. This registered copy of the will would then have been filed and an entry made into the current parchment register recording the date of probate. 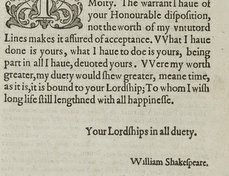 Shakespeare’s original will, the entry of probate, and the registered copy shown here survive. Other associated documents, such as an inventory of his goods, do not survive and were presumably lost with other Prerogative Court inventories for this date in the Great Fire of London in 1666.